It was in seventh-grade biology class that I used classroom response technology for the first time. It was an archaic controller that looked like a Tamagotchi and only had four buttons. Our teacher would post multiple-choice questions on an interactive whiteboard, we would select our answers and the results would be revealed in a pie chart seconds later. It was like magic. We’ve come a long way since that photosynthesis quiz. Both the technology and myself have matured, and I’ve had the opportunity to witness first hand the evolution of hardware and software engagement tools. A variety of solutions have been released onto the market and work to help professors and their students navigate the transforming education eco-system. Technology is enabling a slow but progressive change to a more tech-enabled, student-centred structure. Educators are constantly fighting the uphill battle of trying to keep their students engaged. The National Teaching and Learning Forum revealed that students focus most effectively in intervals of 10 to 18 minutes, and any time over that amount significantly affects how much information they retain. Therefore, it is nearly impossible for today’s students to absorb content when attending lectures that span anywhere from two to three hours. Fortunately, technology is working to improve this reality. The “21st Century Campus Report” revealed that 88% of instructors believe that technology is essential for teaching a class successfully and that it is a useful tool for students. And why wouldn’t they? Technology tools allow teachers and professors to receive constant feedback on their lessons, while also providing an interactive experience for students. By generating insights into the development and special needs of students, instructors have an opportunity to modify their lesson plans and teaching styles, and to discover the topics that should receive more attention or emphasis. In 2011, there were just under two million students enrolled in post-secondary education in Canada. More students means bigger class sizes and, as a result, pressure is put upon both education institutions and companies to develop solutions that will make the learning process as engaging and effective as possible under these circumstances. The very physical design of a lecture hall promotes the one-to-many communication model. For a classroom with 200 to 300 students, there isn’t much actual interaction happening. Classroom engagement tools are working to solve this problem and facilitate the sharing of voices, providing feedback and valuable insights for everyone involved. One company that has seamlessly integrated classroom engagement into existing education devices is MaRS venture Top Hat. Top Hat offers students the opportunity to answer more than seven types of complex questions, as well as to participate in discussions. By offering more functions than just four or six buttons, Top Hat enables students to be evaluated according to their individual needs and learning styles, tailoring perfectly to the changing education system by fitting to the students’ needs, as opposed to the needs of the establishment. The software also works in tandem with students’ existing devices and software. For example, a presenter does not have to exit his or her PowerPoint or Keynote presentation to view the results of a poll or question. Another product on the market is i>clicker, which is a hardware solution. The physical remote has six buttons and enables the presenter and participants to stay connected and involved. I used this device in my second year of university and discovered some challenges. For example, since it’s a separate physical device, it’s yet another object for a student to remember to bring to class. Students could potentially lose marks for forgetting it at home or misplacing it. In addition, after the student has used it, there is the problem of disposal. Imagine if each of those two million students owned an i>clicker—this would contribute significantly to the global e-waste issue. Fortunately, i>clicker is following Top Hat’s lead and now offers i>clicker GO, which enables the software to be used on laptops and smartphones as an iOS or Android app. Our economy is changing. The jobs that students are applying for are knowledge-economy jobs and they require technology that supports them in answering questions in a practical manner. Students need education that exposes them to true-to-life problems, teaches them how subjects are interconnected and allows more opportunities for rich dialogue and conversation (The University of Alberta). The problems that will be tackled in the future are not black and white—they can’t be solved with the click of a button. Students crave tools that are integrated, allow for flexible entry methods and can hold their concentration. I sat down with Mohsen Shahini, founder of Top Hat, to discuss the challenges that educators and students are facing, as well as the classroom of the future. Sarah Aspler: What inspired you to create Top Hat? Mohsen Shahini: It was rooted in my personal passion and desire for learning in general. When I started Top Hat, I was still at university doing my PhD. I found that the classroom environment was completely ineffective. At this time, I was also shifting my research and this required me to learn a lot of biology. I struggled with learning science because I found it challenging due to time restraints and the huge amount of content that I was required to cover. The combination of these two factors led me to come up with this application, which allows people to shift the content to make it more interactive and change the nature of the classroom to allow for more engagement. SA: What are the main challenges that educators and students face in the 21st century classroom? MS: There are a few that we all know. Every year, students’ attention spans get shorter and shorter. This means that we need to change the structure of the lecture and get students engaged. Classrooms are also getting bigger and bigger as a result of the financial restrictions of universities, so merging classrooms is their solution. The third challenge would be distractions, when students come and sit in the classroom and are distracted by their own devices and social media. SA: Do you believe that integrating engagement software onto smartphones and laptops will allow students to become even more distracted? MS: We dealt with this question in the early stages of Top Hat. It was a big question we had for ourselves. 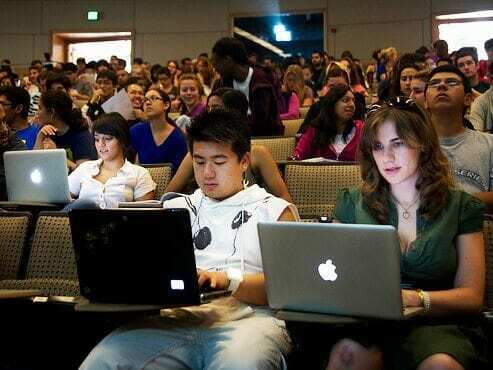 Early on in 2009, when our application was only laptop based, I went and sat in on lectures at the back of the class, which is more visually distracting than smartphones due to the sheer screen size. I found that the rate of distraction was equal in classrooms that used technology and those that didn’t. This is an ongoing debate around technology policies, but I believe that ultimately, it’s up to the students. Professors cannot control their pockets, so I believe banning devices will not necessarily make them learn better. SA: What do you think the classroom of the future looks like? MS: I believe that professors will no longer just be delivering content, but will act more as facilitators of the learning experience. There will be a lot more interactive content in the classroom and virtual reality will play a bigger role. For example, when studying the human body, students could be immersed in an experience where they envision themselves as a molecule and be able to observe content more deeply. I believe teachers will still be able to guide the learning, but that students will be in control of where the content takes them. If you want to think big, I think the classroom will no longer be a place where you solely learn theory, but where you can truly practice what you’ve learned. SA: What advice would you give to entrepreneurs in the education sector? MS: We need entrepreneurs to come to this space. It’s been a very hard sector to innovate in for a very long time because classes haven’t changed in decades. It seems like every other sector changes once every one or two years, but education moves much slower. First of all, entrepreneurs should come to this sector if they are passionate and have the belief that there is a major contribution they can make. Especially in education, you need drive and the ability to pivot because this is a difficult market and not everyone can make a contribution that will stick.